Suffering from tired sore feet? Knee, hip or back pain? In addition to your Chiropractic, massage therapy or laser care you may want to consider wearing custom- fitted orthotics in your shoes and sandals. Painful spine and leg problems are often directly connected with the feet. Imbalances in the way one or both of our feet rests in our shoes or on the ground may cause problems higher up the skeleton. Flat arches for example can contribute to not only foot pain such as plantar fascitis but also aching knees, hips and back. This effect is often called a ‘bio-kinetic chain of events’. Supporting each foot with a well-fitting orthotic may help to relieve joint pain throughout the body. Your feet are unique to you and the left one may even be significantly different from the right. 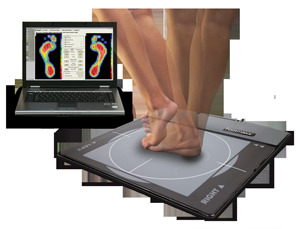 A “gait analysis” is required to determine the need and specifications for orthotics. At Cornerstones , one of our licensed chiropractors will perform both a visual and computerized examination of the way you stand and walk. Form- fitting casts may also be made of each foot. Here at Cornerstones we have been providing Footmaxx Prescription Orthotics to our patients for over fifteen years. We have found that most people are very satisfied with the Footmaxx comfort and streamlined fit that allows you to wear a large variety of your favorite fashion or athletic shoes. An increase in shoe size is rarely needed.